Ordinarily, I wouldn’t be posting another round of sponsor adulation so soon after the last one, but this is a bit of a special case. This dress has traversed the world like a little cloth-based gap year student before landing in my eager mitts after what seemed like an absolute eternity. Oh, but it was worth the wait! Behold the glory of the Jitterbuggin Bybee dress! If you know me at all, you will know that the words ‘Forties’ and ‘peasant’ are like music to my ears. 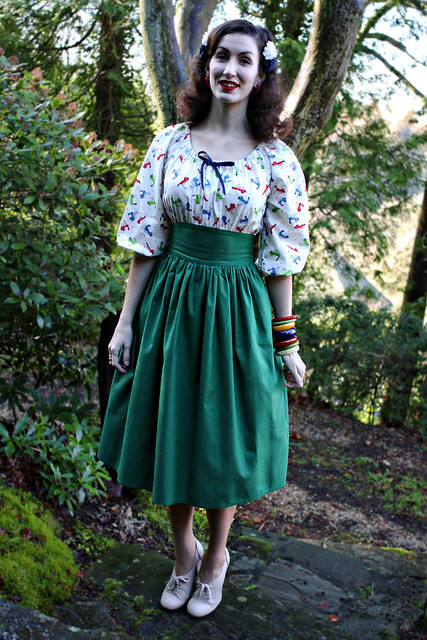 So when Kim from Jitterbuggin got in touch last year and asked if she could sponsor my blog by sending me a Forties peasant dress from her collection, I considered it for approximately 0.237 of a second before shrieking, ‘Bally right you can!’ (or possibly something similar with an expletive). The dress then arrived in England some time in November, and due to our useless postal system, then found itself flying back across the Atlantic. Or, actually, it must have sailed, or even swum back with a quick party stop in Cancun, because it took weeks to sheepishly reappear. Kim stuck it back in the post, and this time it dropped on my doormat, a few days ago. And because it is SO AMAZING, despite it being pretty darned nippy over here in Blighty, I’m bringing spring back a couple of months early. And why not, indeed? 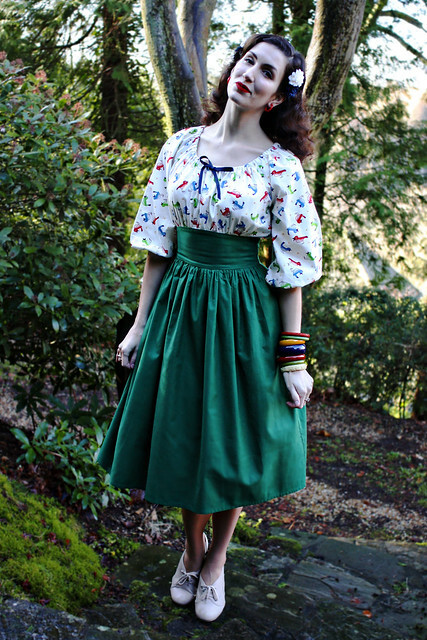 I put it on yesterday, and did a wee bit of posing with some greenery, English rose-meets 40s Spanish señorita style. But I also had a big mission yesterday (the earlier discussed Ginger-based jaunt to Brighton), and so the frock took a trip to some very different British scenery. To the seaside! Can I just say it was blooming parky. Cor blimey, the (hair-ruining!) wind! Sheer brass monkeys, coldy freezingness. Most of the rest of the photos from my trip (which will be revealed early next week) were taken with me firmly wrapped up in my winter coat, but the sunshine was so glorious that I could kiiind of pretend to be on a warm, spring trip to the coast. Brrrrr-acing! These pictures show the exact colours of the dress much better too – deep grass green skirt paired with an amazing feedsack top in cream, scattered with blue, red and leaf green birds and yellow swirls. Click on the picture to see the print in more detail, or go to the Jitterbuggin site for more angles if you so desire. Now obviously, Jitterbuggin clothing is not at the cheap end of the repro spectrum. But it is astonishingly well-made. I know a lot of vintage ladies who are big fans of her blouses as they’re both authentic and durable for daily wear, this dress seems the same. I know you’ll see a LOT more of it on here (I may never take it off), and if you want to treat yourself (or better yet, get someone to treat you) to something really, really lovely, then please go to Kim. But wait! What about a special Fleur discount deal, you cry? Your wish is my command! If you enter the code ‘Vintage Diary’ at checkout, you can get 15% off anything and everything in the store. This deal will be on from now until 12th February (anyone else thinking of a certain present-based event around then? Start dropping hints now!) so do use it if you can. Thanks a million to Kim for setting that up. And if you, like me, are a social networking fiend, please go fan, follow or blog-subscribe to find out about more special offers and new designs and suchlike straight from the source. Gorgeous! This frock is perfect on you! It's fab! I love the pattern against the plain and the shape. Lovely indeed. Kudos for braving the cold- I'm in woollen tights and pullovers at the moment and have to be coaxed to take my scarf and mittens off AT ALL (yes, even indoors). What a fab outfit! I love the fact that the high waist is actually REALLY high – looks awesome! Glorious!! You look smashing, Fleur! Extra points for bravery for posing sans coat – brrrrr! It looks great on you! You are one gorgeous lady! That is a lovely frock, and it really suits you, one of the best things I've seen you in. You are lucky enough to have the right height and slenderness to carry off the fullness of this style. Simply gorgeous – what an absolutely stunning dress! I have to say that I have only recently discovered your blog, and have to say that thus far I utterly adore it. Thank you for keeping it up! Her clothes are stunning and of course Fleur you look beautiful in this! I have to say I think you were very brave it's been freezing lately! GORGEOUS!! I will definatley visit the site, and wow this dress is PERFECT for you! You do the 40s Peasant Senorita so well! I particularly like the second photo of you facing out to the ocean. I have a photo of the Edwardian artist Margaret McDonald [ wife of Charles Mackintosh ] and her sister Frances – standing on a beach in 1903. These pictures have a timeless quality to them. One can imagine them being dug up in 100 years from now.